The mystery of how, exactly, the pyramids in Egypt were built may have come a step closer to being unraveled. A team of archaeologists made a chance discovery in an ancient Egyptian quarry. While the theory that the ancient Egyptians used ramps to move the stones. It has already been put forward, the structure found by the Anglo-French team, which dated from about the period . 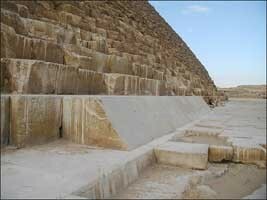 It stated that the Great Pyramid of Giza was built, is significantly steeper than was previously supposed possible. They believe the inclusion of the steps and the potholes either side of a ramp way suggests the builders were able to haul from both directions. Rather than simply dragging a block behind them. The team believes those below the block would have used the posts to create a pulley system. While those above it pulled simultaneously. For 4,500 years, the Great Pyramid has stood like a giant Goliath defying anyone from learning its secrets. Only the “Stone Cut Out Without Hands” can knock it down. It can also enable us to look at the hidden chambers within its vast depth. The Great Pyramid of Egypt is the only survivor of the 7 Wonders of the Ancient World, and it is GIGANTIC. It covers an area of 13 acres and 30 Empire State Buildings could be built with the estimated 2,300,000 stones. It contains more stones than was used in all the churches, cathedrals, and monasteries built in England since 313 AD. A wall of 6 ft high and 1 ft thick could be built from New York to Los Angeles. By only using the amount of masonry contained in the Great Pyramid of Egypt. Another remarkable feature is the fact that the limestone blocks in the building have barely settled in over 4,700 years. Until the construction of the Eiffel Tower in 1889, the Great Pyramid was the tallest structure in the world. Before the Great Pyramid was stripped of its shining white limestone casing stones. Water marks were visible half way up (240 ft). The Pyramid survived a massive earthquake in 1303 with no interior damage. But the lime-stones were loosened and later carted away to Cairo to build mosques. Before the removal of the casing stones, many people were eyewitnesses to the veracity of the Great Flood. The theory which make this most mysterious is Orion correlation theory (or Giza–Orion correlation theory). The constellation of Orion is one of the most prominent and recognizable constellations in the sky. Its location on the celestial equator allows it to be seen all over the planet. It was of central importance to many ancient cultures. 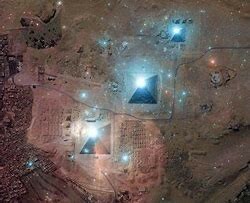 The alignment with the position of the stars matches up precisely to various ancient structures. From the pyramids at Giza to those found at Teotihuacán in Central Mexico.We know from The Pyramid Texts that the ancient Egyptians. They believed that the gods descended from the belt of Orion and from Sirius (the brightest star in the sky) in the form of human beings. Pyramids texts are among the oldest religious writings in the world. This is critically important to Egyptian cosmology. As Orion was associated with the god Osiris and Sirius was associated with the goddess Isis. It is said that both together created the whole of human civilization. The three pyramids at Giza are some of the most mysterious, perplexing, and magnificent ancient structures in the world. Together they demonstrate the concept of sacred alignment. They form a precise three dimensional map of the stars in the belt of Orion onto the ground. Their size and placement also takes into account both the visible brightness and location of the stars. Within Orion’s belt, two larger pyramids are lined up perfectly in comparison to the smaller offset pyramid of Menkuare. Additionally, the Giza plateau is located at the geographical center of the Earth. It means that it is positioned exactly in the center of the Earth’s landmass. The central pyramid, Khufu, is not only the last remaining of The 7 Wonders of the Ancient World. But it is more aligned to true North than the Greenwich observatory in London. How is that even possible at that time. Wants to Share the curiosity of Cosmos to every penurious person who is enthusiastic like me for knowing about the enormous Space and its Energy.